(UPTOWN CHARLOTTE, NC) -- In a nail-biter from start to finish, the Charlotte Knights used a historic night at the plate from Ryan Cordell and a two-out rally in the bottom of the ninth to storm back and beat the Norfolk Tides 10-9 on Wednesday night at BB&T Ballpark to finish off a three-game sweep. Down 9-8 going to the bottom of the ninth, the Knights began the comeback with Cordell's one-out single. Seby Zavala followed with a walk. Following a wild pitch, pinch-hitter D.J. Peterson was walked intentionally to load the bases. Alcides Escobar then popped up for the second out. Down to their last out, the Knights tied the game as Brandon Guyer 's pop-up fell for an infield single to score Cordell. 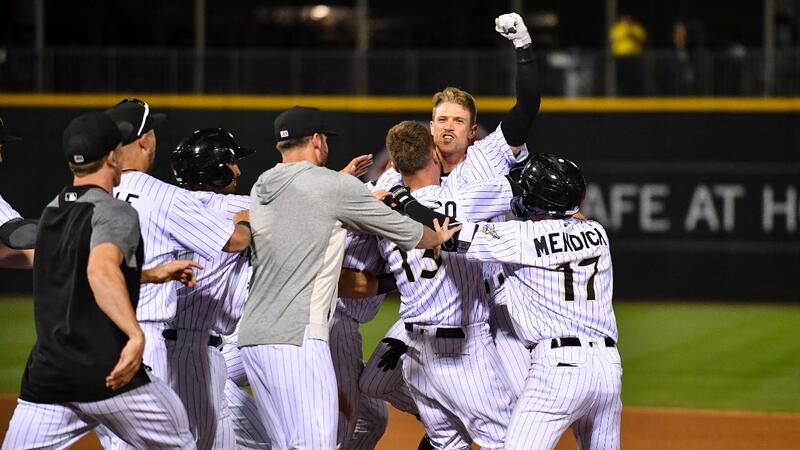 The next hitter, Charlie Tilson, lined an 0-2 pitch into left for a walk-off single, starting a wild celebration in center field as the Knights finished their opening homestand with a 6-1 record. RHP Donny Roach started for the Knights and gave up three runs over the first two innings. Escobar got the Knights on the board with an RBI double that scored Cordell, who doubled earlier. In the third, Cordell propelled the Knights in front with a long three-run home run to left, his first with the Knights this season, to give Charlotte a 4-3 lead after three. Roach finished with four earned runs against on five hits with two walks and four strikeouts over 5.0 innings pitched. Zavala regained the lead for the Knights with his first home run of the season, a two-run blast to left in the bottom of the fifth that scored Cordell, who recorded his third hit with a triple. The Tides were quick to respond with four runs in the seventh to take the lead. Cordell then completed the cycle with a line drive single to left. His cycle is the first in Minor League Baseball this season and the first by a Charlotte Knight since Alex Gonzalez in 1998. Tilson and Danny Mendick each recorded RBI hits to tie the game in the eighth, but a wild pitch gave Norfolk the lead in the ninth, setting the stage for Charlotte's walk-off win. RHP Juan Minaya (1-0, 6.75) earned the win out of the bullpen for Charlotte. Cordell finished 5-for-5 with four runs scored while Tilson was 3-for-5 with two runs and two RBI. The Knights hit the road for the first time this season as they start a four game series with the Indianapolis Indians (Triple-A affiliate of the Pittsburgh Pirates) on Thursday night from Victory Field. Pre-game radio coverage of Thursday's 7:05 p.m. game is set for 6:50 p.m. on 730 The Game ESPN Charlotte. The "Voice of the Charlotte Knights" Matt Swierad will have the call for all of the action.